The eyes tell more than words can ever say. Microblading is a semi-permanent eyebrow procedure in which superficial strokes are made in the skin inside the brows. Filled with a pigment complimentary to your skin and hair color, this procedure gives the appearance of real hair and a fuller brow. Microblading falls under the category of permanent makeup, but it is actually a semi-permanent eyebrow procedure. 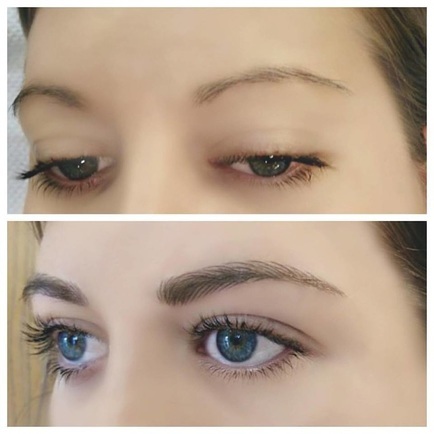 Microblading is different from traditional eyebrow tattooing in that it is not permanent and does not use ink. The pigment usually lasts from 12-18 months and won't fade to pink, green, or grey, the way tattoo ink usually does. The new pigmentation typically lasts between 12 and 18 months and when used in conjunction with pigment creams, you will benefit from a more natural look that won't fade. This procedure is painless due to the topical numbing cream used and requires two visits. Since the color fades over time, yearly touch-ups are recommended to maintain optimal results. Even after your first treatment, you will leave our office with gorgeous, natural looking brows. Our microblading specialist will consult with you about your desired look, perform measurements and draw on your brows before hand to show you what the end result will be. Microblading treatments consist of two sessions to achieve the most natural look: saturation visit and perfection visit. The visit lasts about two hours. The brows are shaped, topical numbing is used for little to no discomfort, and brows are then microbladed with a specialized hand tool with tiny blades. The main hair strokes are done during this visit, and you will leave with newly shaped, fuller bows. Photos will be taken when you arrive and before you leave, so you will have a microblading before and after photo to take home with you. This return visit lasts about an hour, and is typically scheduled between two and four and weeks after your first treatment. Your initial pigment will have faded and the microblading specialist will determine if you might need a darker pigment. Your microblading specialist will add fine, very small hair strokes to give your brows the most natural look possible. Touch-ups will not be needed for another 12 to 18 months. Always wash your hands before touching the eyebrow area. Apply creams or oils with a clean, disposable, single-use cotton pad or swab. Avoid excessive sweating, swimming, or activities that could cause the micro bladed area to be wet for extended periods of time. Avoid touching your eyebrow area, except to clean and apply creams or oils, until it has healed. Keeping the eyebrow clean and dry is important for preventing infection.